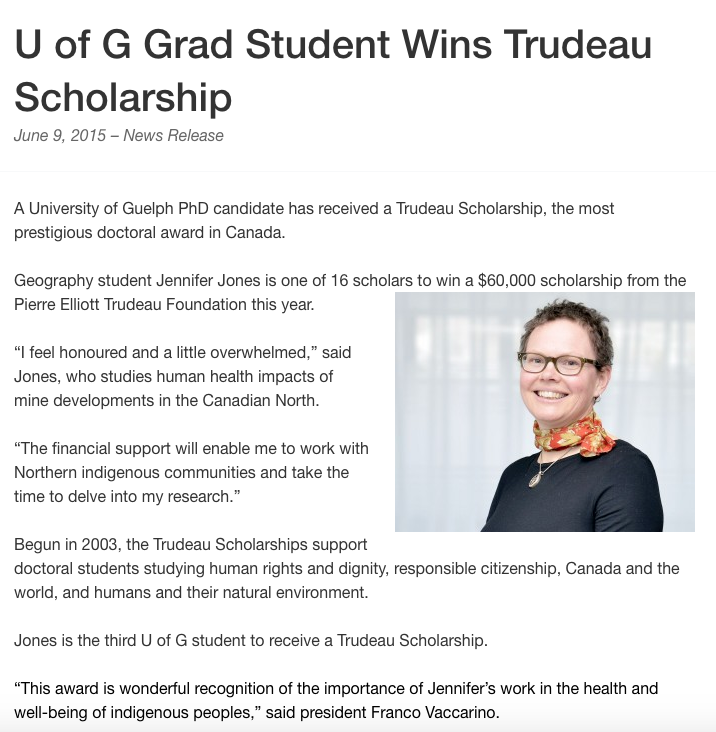 Huge congratulations to Jen Jones, PhD student at the University of Guelph, was awarded a prestigious Trudeau Foundation Doctoral Scholarship to support her community-based and community-led work on the impacts of mining and resource development on community wellbeing in the North. This is a tremendous achievement, and a recognition of the quality of Jen’s work, her intellectual prowess, and her long-term relationships with Indigenous communities in the Yukon. I am thrilled to be working with and learning from Jen throughout her graduate process. Click here to read the press release through the University of Guelph, and click here to visit the Trudeau website.